It’s Monday morning, and I’d like to start by asking if there’s anyone who doesn’t yet understand the desperation of the powers that be, to allow anything that might accelerate the inevitable collapse of history’s largest, most destructive fiat Ponzi scheme? On a weekend chock full of “PM bullish, everything-else bearish” developments, the gold Cartel started the week with the 174th “Sunday Night Sentiment” raid of the past 183 weekends; and the 786th “2:15 AM” EST attack, via the prototypical “Cartel Herald” algorithm, of the past 903 trading days. They even had help from our “friends” at Kitco – which despite the fact that the dollar index’s early, minuscule gains had turned into losses hours earlier; still had a “top story” on their website, as of the COMEX open, proclaiming “gold weaker due to dollar strength following Trump, Abe meeting.” As if a meeting between two of the world’s most destructive money printers somehow matters to the primary component of the dollar index – the Euro/dollar exchange rate; or that anything they could possibly agree upon would be “gold bearish.” Let alone, the fact that the one thing they did appear to agree upon – Trump’s unqualified support of Japan, in its ongoing, potentially war-catalyzing spat with China over the disputed Sankaku islands – was as “gold positive” as could be imagined. Not to mention, the inconvenient fact that by the time the COMEX opened, the dollar index was down. 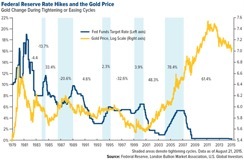 Yet, for “some reason,” gold prices did not recover their “strong dollar” catalyzed losses. If Whirlybird Janet can’t put on her best poker face, and convince the world at her semi-annual Humphrey-Hawkins Congressional testimony tomorrow morning, of her comically blatant lie about the U.S. job market being near “full employment”; and thus, that the economy – and stock market – can handle the three interest rate increases the clueless Fed’s current “dot plot” anticipates this year. You know, like the four rate hikes they predicted for 2016, less than a year ago. And by the clueless Fed, consider the following quote from this weekend, by Vice Chairman Stanley Fischer – in what can best be described as a prototypical “sign of the times,” of how little “omniscient” Central banks know; and consequently, just how little time likely remains on their global reign of monetary terror. This, from the man who, following Janet Yellen’s Jackson Hole testimony in late August, practically guaranteed two rate hikes by the end of 2016. Not that such a scenario is “gold negative,” mind you – per the below chart, and any reasonable application of common sense. However, in a world characterized by “FUD” dissemination and round-the-clock market manipulation, it’s the Miles Franklin Blog’s job to remind you of the reality of actual, historically-proven economic and financial market relationships. As for today’s theme, it’s the aforementioned concept of just how troubling the “signs of the times” are – and likely will be for the foreseeable future, as history’s largest, most destructive fiat Ponzi scheme hurtles toward it’s inevitable demise; which countless nations are experiencing now, and the rest will shortly. To wit, the “all out trade and currency wars” that seem to accelerate with each passing day; as witnessed directly this weekend, when the PBOC devalued the Yuan to a five-week low; and indirectly, when the Swiss voted to maintain near zero corporate tax rates for foreign corporations that move to Switzerland; which in turn, will “intensify” competing nations’ responses. To that end, how much more obvious can it be that it’s not just a dying economy that’s responsible for U.S. Treasury’s tax receipts declining for the first time since the 2008-09 financial crisis? Not to mention, Valentine’s Day retail spending, for the first time since 2009. Here in the United States of Crony Capitalism, the grand “swamp drainer” himself now has four former Goldman Sachs bankers in his inner circle – and is on the verge of appointing a fifth, for the number two role at the Treasury Department. Better yet, he also nominated Bear Stearns’ former Chief Economist to a leading Treasury Department role. This, after last week’s “executive order” to repeal Dodd-Frank financial industry regulations, for anyone that actually believes the self-proclaimed “King of Debt” has any intention of reining in Wall Street; auditing the Fed; or doing anything that might cause history’s largest financial bubbles to burst on his watch. Oh well, I guess we’ll just have to let the undefeated, insurmountable forces of “Economic Mother Nature” do it for him. Next, there’s the Goebbels-esque propaganda that, like actual Goebbels propaganda, is fated to collapse under the weight of its own hideous lies, sooner rather than later. Like last week’s massive, historic U.S. crude oil and gasoline inventory builds – the latter, to an all-time high level – being “miraculously” offset in the oil pits by “news” that OPEC’s impossible to quantify compliance with its fictitious production cut “deal,” was – Hooray! – 90% in January. Or in Greece, just as its stock and bond markets were crashing to their multi-year, post-BrExit lows – based on dramatic rising odds that the inevitable GrExit will occur this year; the EU and IMF “miraculously” agreed to take a “common stand” in the current round of miserably failing bailout negotiations. Not that said “stand” was quantified; or that any “stand” will make it more likely that Greece will survive through 2017 as is, of course. But when financial markets are rigged to make it look that way, the current “sign of the times” is that such stays of execution typically work. That is, until they no longer do. Last but far from least, my good friend John Rubino wrote this weekend of the ultimate sign of the times – in his must read article, “what form will the Great Confiscation take — and how can we prepare?. In which, he discusses the rising threat that desperate governments will in some way, shape, or form, attempt to confiscate your assets – either directly or indirectly. Principally, to maintain the dying status quo; and secondarily, to milk every last penny from the world’s “99%” in the process. From (taxpayer-funded) bailouts; to bail-ins; capital controls; cash bans; negative interest rates; hyperinflationary monetary policy; and even outright theft, essentially all options are currently on the table. All of which, have at some point in the very recent past been utilized. And as said historic Ponzi scheme implodes, I ASSURE you that the amount, and intensity, of such “confiscations” will only accelerate – from “first world” economies like the U.S., to “third world” ones like Zimbabwe. Thus, to ignore the blatantly obvious “signs of the times”; and thus, an historic opportunity to not only protect yourself, but potentially profit greatly – would be as shameful as any act of ignorance, willful or otherwise, in financial market history.